The Chronicles of Harris Burdick by Chris Van Allsburg. Review: Harris Burdick has cast a long and strange shadow across the reading world, not unlike a man, lit by the moon, hiding in the branches of a tree, staring through a window and holding a rare and sinister object, who cast a long and strange shadow across your bedroom wall last night. And so begins Lemony Snicket's introduction to the long-awaited compilation book that brings some kind of closure to the illustrations that have puzzled readers for more than twenty-five years. 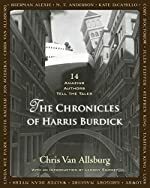 The Chronicles of Harris Burdick by Chris Van Allsburg is a compendium of 14 amazing stories told by 14 highly-acclaimed authors. In 1984, Chris Van Allsburg published a collection of illustrations with a most mysterious premise titled The Mysteries of Harris Burdick. This book was merely a collection of some of the most thought-provoking illustrations with a title and subheading. For example, one picture is of a woman getting ready to carve a pumpkin that is glowing. The title is "Just Desert" and the subheading is "She lowered the knife and it grew even brighter." Yes, the word is "desert" NOT "dessert." Teachers have been using The Mysteries of Harris Burdick for over two decades as creative writing prompts and springboards for problem-based learning activities. Now, Chris Van Allsburg has teamed together some of the best writers of this generation to bring words to these pictures. Some of the stories are funny, some are magical, some are thought-provoking, and some are just plain creepy. The Chronicles of Harris Burdick is amazing. Certainly some stories are better than others; in fact a few are disappointing. But, most stories are simply astounding. As with any short story compilation, readers will prefer certain stories over others. The introduction by Lemony Snicket draws readers in immediately. As he says, "As you reread the stories, stare at the images, and ponder the mysteries of Harris Burdick, you will find yourself in a mystery that joins so many authors and readers together in breathless wonder." Having read the stories as a reader and as a teacher, most stories do not disappoint. After reading "Just Desert" to my 6th grade class on Halloween, they were beyond excited and sufficiently "creeped out" by the end. And, "The Third-Floor Bedroom" is filled with such symbolism and character development that we were able to spend an entire class period analyzing it! Readers have been creating their own stories to accompany the Harris Burdick illustrations, and it is so exciting to finally read what others have seen. Lemony Snicket says it best when he writes "the mysteries of Harris Burdick continue, and if you open this book, you will likely be mystified yourself." We would like to thank Houghton Mifflin Harcourt for providing a copy of The Chronicles of Harris Burdick for this review. Have you read The Chronicles of Harris Burdick? How would you rate it?